----CLICK HERE for regular scheduled shows!! Three big shows this week including Friday night at NEW for the awards ceremony. RRO will also be in Ripley, TN on Saturday night!! On-Sale Date: Tickets now on sale!!! Traditional Championship Wrestling debuts in Clarksville! TCW - Where tradition lives on! -2.26.10 - New Experience Wrestling West Memphis, AR - Awards Ceremony!! 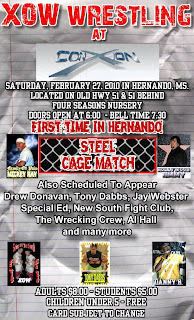 -2.27.10 - EWE "February Fallout"
-3.05.10 - RCW Trumann, AR - RCW DEBUT!! PLEASE CONTACT ME ASAP TO BOOK YOUR PROMOTION FOR THE YEARBOOK TOUR!! I will announce more dates next week!! I am accepting dates up to the April 16-17th weekend.